Comments placed on the website of The Next Truth will be forwarded to dr. Brian Keating. 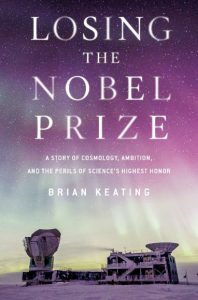 Reading “Losing the Nobel Prize” the world starts to blaze into the background as dr. Brian Keating slowly draws the reader into his life story with a laughter and a tear. Describing the earliest moments in where the universe aroused the curiosity of a 13 year young boy, the emotional moments while his father was fighting cancer, up until discussing the doubts if he and his team truly held the biggest scientific discovery in their hands, let both ones mind and emotions wonder the fabrics of time and space while waking up the inner scientist in each one. to a famous blogger if you aren’t already.